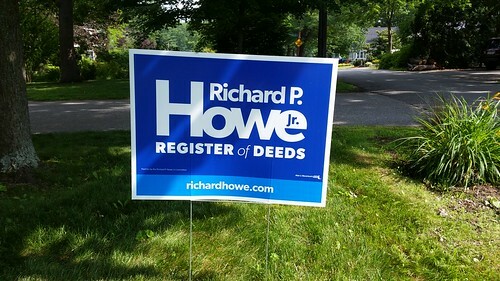 Richard Howe for Register of Deeds lawn signs are in. Please help my re-election campaign by displaying a sign in your yard. Just SIGN UP for a lawn sign and we’ll deliver it to your home as soon as possible. There’s a move underway to bring outdoor chess to Lowell. 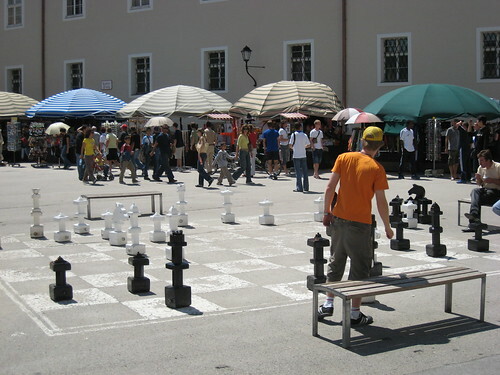 Not the kind you play while sitting at a café table under a tree, but the kind that uses a giant chess board painted on the pavement with life-sized pieces just like the one shown in the photo above. So where should this outdoor chess board go? I vote for Lucy Larcom Park, but perhaps JFK Plaza right next to City Hall would be the right spot. Or perhaps at Kerouac Park? Please leave a comment with your suggestions. Lowell exists because of cotton. The city arose in the early 1820s on a patch of sparsely settled farmland and pasture along the Merrimack and Concord Rivers for the purpose of producing cotton cloth made from raw cotton picked by enslaved Africans in the American south. Yet from Lowell’s founding in 1826 until the start of the Civil War, Lowell was a center of the American anti-slave movement. This friction between the economic interests dependent on the American system of slavery and the recognition of its inherent wrongness played out in Lowell in countless ways for more than three decades prior to the Civil War. 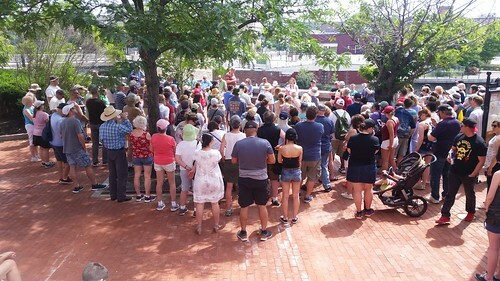 One way the anti-slavery impulse was evident in Lowell was by the number and quality of Abolitionist speakers who came to the city to be heard. One of them was Frederick Douglass who spoke in Lowell several times. The city of Lowell will participate in this nationwide reading. The event will take place on Thursday, July 5, 2018, from noon until 1:30 pm at St. Anne’s Church, 8 Kirk Street (corner of Merrimack). Please visit Lowell National Park’s event page for more information and to sign-up as a community reader. The full text of Douglass’s speech is available on the Teaching American History website. Students at the Career Academy of the Lowell Public Schools took on an important local issue as part of their Community Impact course: What to do when you find a stray needle. This was important to students because a friend had recently been stuck by a stray needle while playing basketball. From their research, the students learned that the city of Lowell has a formal protocol in place for city employees and members of the public who discover a stray needle. The proper procedure is to first put some kind of physical barrier like a chair or similar object around the needle, then call the Lowell Police non-emergency line. A Trinity EMS vehicle will then be dispatched to the scene to properly remove and dispose of the needle. 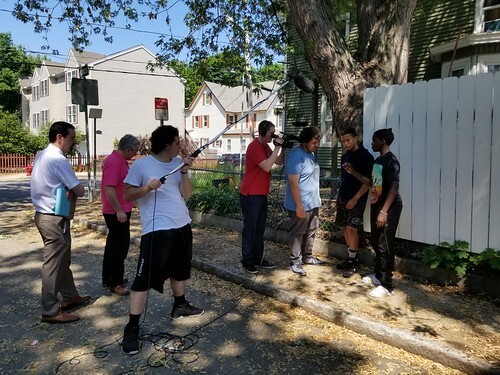 To help raise community awareness of this procedure, the Career Academy Students partnered with the school department’s Creegan Media Studio to film a Public Service Announcement that will play on local cable stations and will be shown in Lowell public school classrooms. The video is not yet available on YouTube. Once it is, I will post a link here. In the meantime, congratulations to the Career Academy students for taking on such an important project. 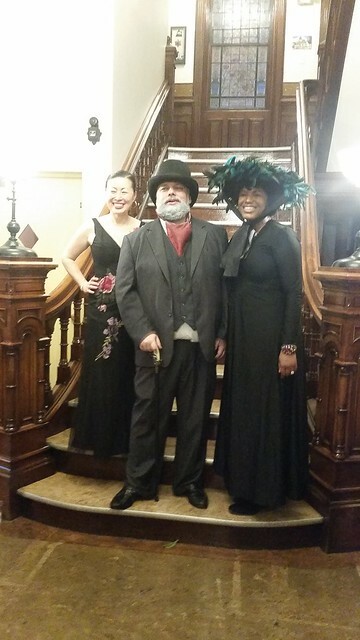 Coalition for a Better Acre executive director Yun-Ju Choi with Mr. & Mrs. Frederick Ayer who opened their home for the CBA fund raiser this year. June is a busy month for Lowell nonprofits. Many of them hold major fund-raising events during the month or earlier in the spring. These events are fun to attend, are reasonably priced, and demonstrate the generosity of Lowell residents and businesses. Since April, major events have been held by the Lowell Association for the Blind, the Brush Gallery, Merrimack Valley Housing Partnership, Lowell Catholic High School, Community Teamwork, Greater Lowell Community Foundation, Mill City Grows, Lowell Housing Authority’s Lowell Youth Activities Scholarship, and Coalition for a Better Acre. I’m sure there are many more. On top of all that, the city’s cultural affairs people have crowd funded nearly $30,000 in donations to pay for improvements to Kerouac Park. Because of the amount raised, this project qualifies for $25,000 in matching funds from MassDevelopment, giving the city more than $50,000 to spruce up one of the city’s great downtown parks. People often ask what separates Lowell from other Gateway Cities not just in Massachusetts, but around the country. I think efforts like this are part of the answer to that question. Thanks to Kerry Regan Jenness and Wayne Jenness for leading a terrific Lowell Walk yesterday morning. 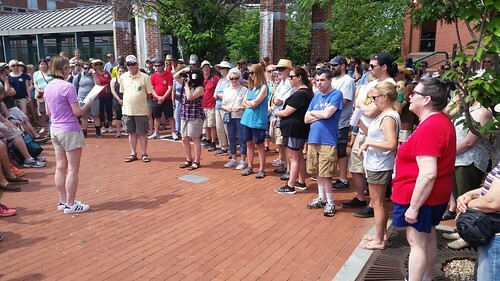 Despite the pre-holiday weekend and temperatures in the 90s, a record-breaking 212 people participated in the tour. Afterwards, many who could not make it pleaded online for the stories from the tour to be shared. Kerry and Wayne graciously agreed to send me their notes which I will post on this site sometime in the coming week. Outdoor chess–I vote for “All of the above!” I would specifically like to see permanent chess tables similar to those which used to be in Harvard Sq in front of Au Bon Pain until renovation of the building began several years ago. But I also would like to see at least one of the giant chess boards that I think Lucy Larcom Park would be a good location for. If chess tables, Lucy Larcom, but if large display, JFK plaza. Or both? 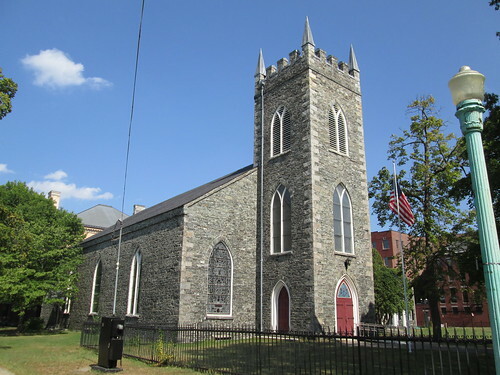 Richard could you possibly give a talk to the St. Rita’s Women’s Club Sodality about the Catholic Churches in Lowell. We meet the second Monday of the month and it would be a one hour talk. Please let me know if you or someone you know could give us a talk.